They've tried putting up safety nets, scrapping the suicide compensation, and bringing in an external dorm management company, but nothing's stopped the trickle of suicides at their factories. 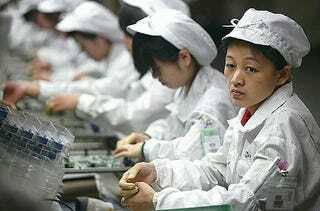 Now, Foxconn thinks hiring more mature workers will solve their problems. After two types of anti-psychotic drugs were found in the 22-year-old worker's dorm last week after she jumped to her death, it's said Foxconn is going to get tougher on its hiring.